HJC Design Blog: Washington, Yay! Tampa, Nay! A little late to the party, but everyone likes to agree or disagree with opinions right? 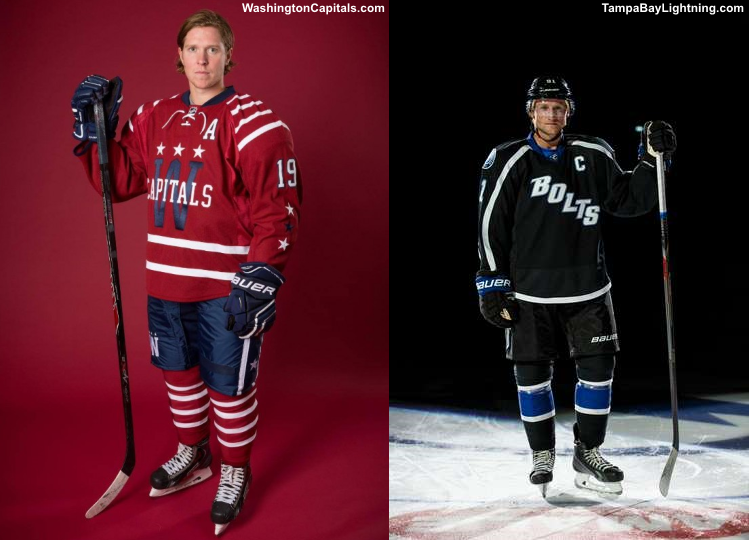 Last Tuesday (September 23) the Capitals showed us what they will wear for the 2015 Winter Classic. 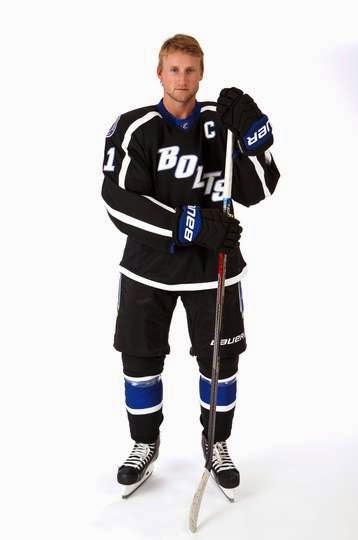 Then on the following Friday (September 27) the Tampa Bay Lightning revealed their new black 3rd jersey. 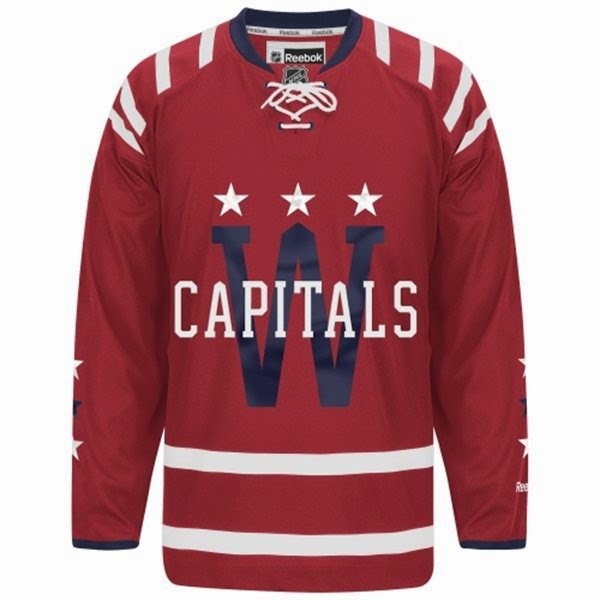 I'll start with the Capitals, who were somewhat limited with their jersey choices for the Winter Classic (80's era or 90's era). That is if they decided to do a direct throwback, which they did not. 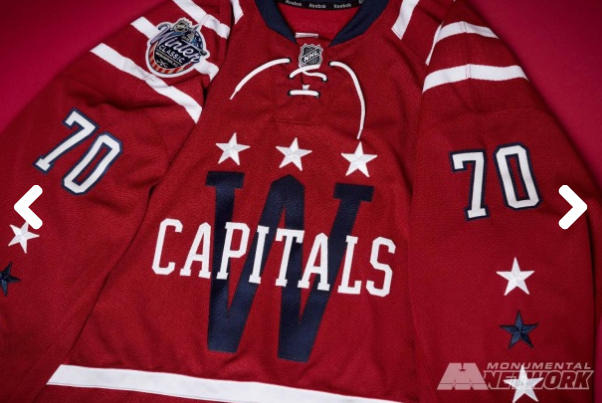 The Caps have created a red fauxback jersey which really looks great. Upon first look I gave this sweater a 9/10. That has since dropped a point, but there are many things that this sweater does right. In my opinion the best part of this uniform is the logo. It looks like a simple logo that would have been created back in the 30's or 40's. Then when you take a longer look you discover its charm. The mid-point on the big W and the points on the A's are shaped like the Washington Monument! The alternate version of that mark, featured on the pants, comes without CAPITALS written across it and looks just as good as the primary. I really like the pseudo shoulder yokes. Really they are Reebok's standard full sleeve design, but they've been cut off at a traditional cut off point for shoulder yokes. The simple four stripe pattern works so well for this fauxback. The collar laces and stars at the bottom of the sleeves do a great job fitting in with the theme of the jersey. The stars are a direct nod to the original red Capitals sweaters and the laces are a must. Only 3 of 13 Winter Classic jerseys (waiting on #14) have not had collar laces. It's not all smiles and sunshine with this jersey. The biggest drawback is the numbers. I guess whoever was on the design team got the impression that the elongated numbers from the Stadium Series games provided "better visibility for broadcasters and fans", as the NHL and Reebok would like us to believe. You make your own call on that. To me they look gimmicky and thinned out. As a result, they're not as strong as I would like to see. As hockey sweater numbers always have been! A big X on this jersey will be the price tag. 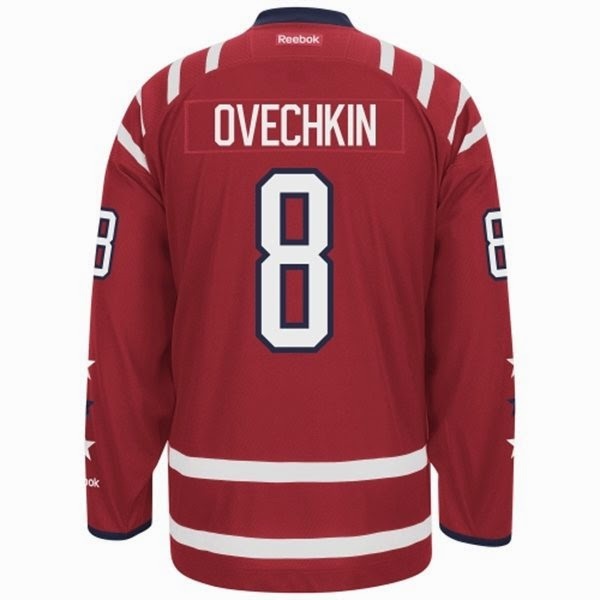 Reebok continues to raise their prices and as of this writing an Alex Ovechkin Winter Classic jersey on Shop.NHL.com will cost you $179.95, and the jerseys were not yet available on the Canadian version of the website (don't get me started). A really great looking jersey that got a 9 on first impressions. Then lost a full point when Reebok super glued their bells and whistles on to it. 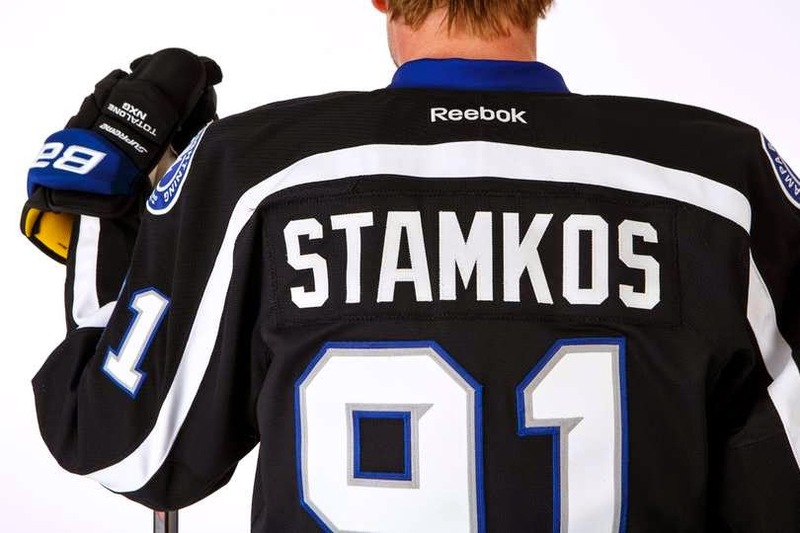 Ladies and gentlemen, your NEW Tampa Bay Lightning Alternate jersey! There's not much to get excited about for this one. Seriously, there's not much on this jersey. The Lightning tried to prank some of their players with a fake third jersey. Turns out, if you remove the palm trees from that jersey, it's a lot better than the real thing. I like the little silver points in the player numbers. It ties those numbers in with the wordmark on the front. I guess that's too difficult to do for the smaller TV numbers because those points aren't there. I'm also a big fan anytime a team wants to share their Reebok jersey sheet with us. I love seeing these and how Reebok represents their jerseys, digitally. The jersey is black. Like, really black. Actually that may have been the only idea presented at the design meetings. There's really nothing going on here. Some bold white stripes run down the arms and we have the BOLTS wordmark on the front, which I liked on the blue jersey. This jersey is really plain. I'm actually offended that Reebok didn't lower the price for this jersey. The prices go higher for Stadium Series jerseys and I assume it's because they have more going into them because they're just oh so special. Well this jersey is the opposite of those Stadium Series jerseys. Nothing went into this jersey, except a lot of black. A very boring jersey that has nothing going for it. I agree. The lightning jersey just looks like a fancy practise jersey.